This exciting exhibition celebrating the relationship between the British and their national drink brings together historic artefacts with cutting-edge contemporary designers. 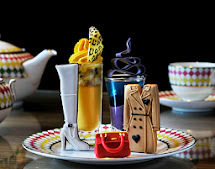 The accoutrements of tea drinking - teapots, kettles, milk jugs and sugar bowls, teaspoons and tea cosies – describe the evolution of the ceremony surrounding this most important of British beverages. There is much to explore and delight in here, including fine silverwork, revolutionary pottery techniques and spoons the shape of which will amaze you. The Gallery Restaurant is the place for this very special breakfast, in which Darjeeling teas are presented to the assembly by our expert, accompanied by breakfast dishes designed to complement your breakfast brew. Ticket Price: £25 includes a sample of Darjeeling to take home. Informal afternoon event in the Diamond Jubilee Tea Salon. Enjoy Fortnum’s famous Afternoon Tea, and ask our on-hand expert any question you have about the British national drink. Learning can be delightful recreation at Fortnum & Mason. Drawing Room, Fourth Floor. Ticket Price: £50. Reservations: 0845 602 5694. Join experts on a journey of self-discovery. You will learn about the teas that are suitable for blending, their qualities and affinities with each other. Different blends will be tasted and discussed, so that, at the end of the session, you will be sufficiently confident to mix your very own blend of tea. Join there erudite expert to learn about the fascinating history of tea, from its discovery in China to the rare teas that are making such a splash today. The event is accompanied by tea-inspired canapés from our talented chefs.